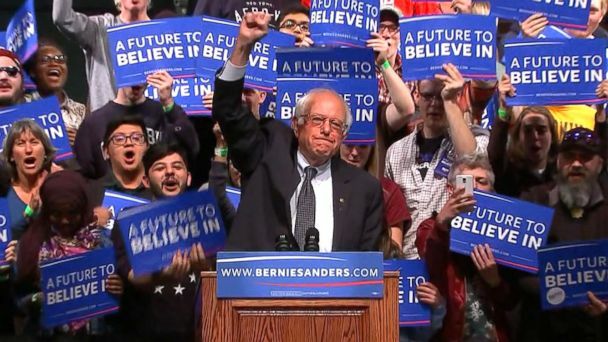 ABC News projects that Sen. Bernie Sanders will win the Wisconsin Democratic primary, based on analysis of the vote. With 61 percent of the expected vote in, Sanders led front-runner Hillary Clinton 56-44 percent. "With our victory tonight in Wisconsin, we have now won seven out of eight of the last caucuses and primaries and we have won almost all of them with overwhelming landslide numbers," Sanders said at an event in Wyoming tonight. Sanders has already begun fundraising off of tonight's victory, sending out an email to supporters declaring "an overwhelming victory." There are 86 pledged delegates and 10 superdelegates up for grabs by the Democrats, and no matter who wins, it won't make-or-break the nomination for them. According to ABC News estimates calculated before tonight's vote, Clinton had a total of 1,712 delegates and Sanders had a total of 1,011 delegates. But 27 percent of Clinton's delegates are superdelegates while only 3 percent of Sanders' are superdelegates. Superdelegates can change their minds at any point until the convention in July. Clinton spent the fewest number of days in the state and made the fewest stops since declaring her candidacy -- only spending five days there and making nine stops. Sanders spent nine days total in the state and jammed 17 events in during that time. According to preliminary exit poll data, about three-quarters of Democratic primary voters are "excited" or "optimistic" about the prospect of a Sanders presidency, as are seven in 10 about a Clinton presidency. That said, the level of reported excitement is about twice as high for Sanders than for Clinton, the data show. Roughly six in 10 voters today say honesty or empathy are most important to their vote; such voters have been more likely to support Sanders (especially honesty voters) in races to date. Despite Clinton's far more extensive foreign policy resume, about as many think Sanders would be a better commander in chief as say so about Clinton, according to the Wisconsin exit poll data.